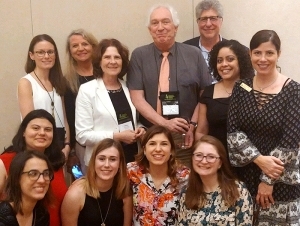 Lawrence Maheady, professor and Horace Mann Endowed Chair in the Exceptional Education Department, was honored by the Teacher Education Division of the Council for Exceptional Children. He received the TED/Pearson Excellence in Teacher Education Award at the organization’s 2018 conference. “This is one of the highest international honors given to those whose career achievements have made a profound impact on the field of teacher preparation in special education,” said Lisa Rafferty, chair and associate professor of exceptional education. The TED/Pearson Excellence award recognizes an individual who has demonstrated an exemplary commitment to “teacher education in special education, the preparation of future leaders and/or quality educators, or research supporting the preparation of teachers and/or delivery of services to children with disabilities, legislative leadership, and scholarly works.” According to Rafferty, Maheady has excelled in all three areas. Students recognize Maheady as passionate and knowledgeable. He is especially noteworthy for his hands-on work in K-12 schools where he works directly with teachers and children. His research spans a period of nearly 40 years; he has focused on evidence-based teaching practices and his publications inform best practices across the country. Joanne Ryan, who taught business courses at the East Aurora Union Free School District before joining the faculty of the Career and Technical Education Department several years ago, was named the 2018 New York State Teacher Educator of the Year by the New York State Association for Career and Technical Education (NYSACTE). She will receive her award at the 2018 Joint CTE Conference in June. She was recognized for her hard work and dedication, and for her remarkable dedication to her students, the profession, and NYSACTE. “She has a reputation for being a world-class teacher,” said John Popovich, chair and associate professor of career and technical education. “She is a state leader and a local legend.” Ryan will be considered for NYSACTE’s Region I Award.